The photo I have chosen for the Beloved challenge from the Daily Post is of some cacti. They are the descendants of one given to me by a beloved great-aunt, who died in her eighties, while I was a child. The original plant became too large to keep indoors. Some of its descendants are possibly a similar size now, but have been put outside, where they are surviving our winter temperatures. New plants appear around the base and the ones in the photo have been repotted and (in my view) are ready for a new home. The species is a variant form of Agave Americana. 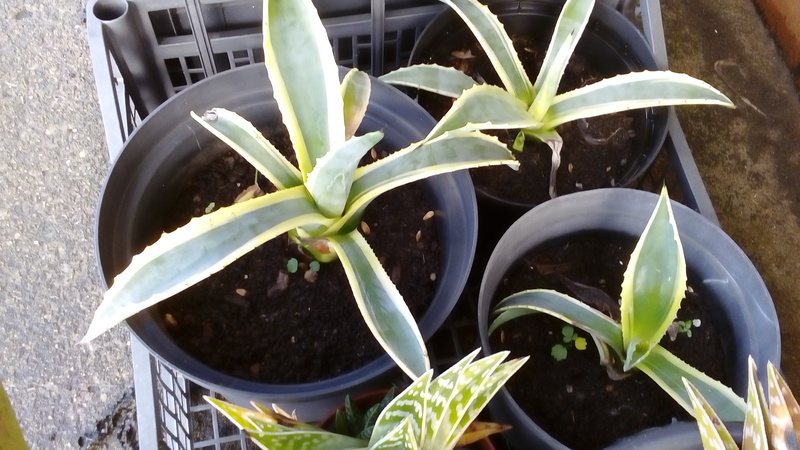 The variegated leaves in the foreground belong to Aloe variegata, another plant I have had for many years. I have forgotten its provenance.